Remember that streak of healthy recipes I shared with you? Well, it’s over. 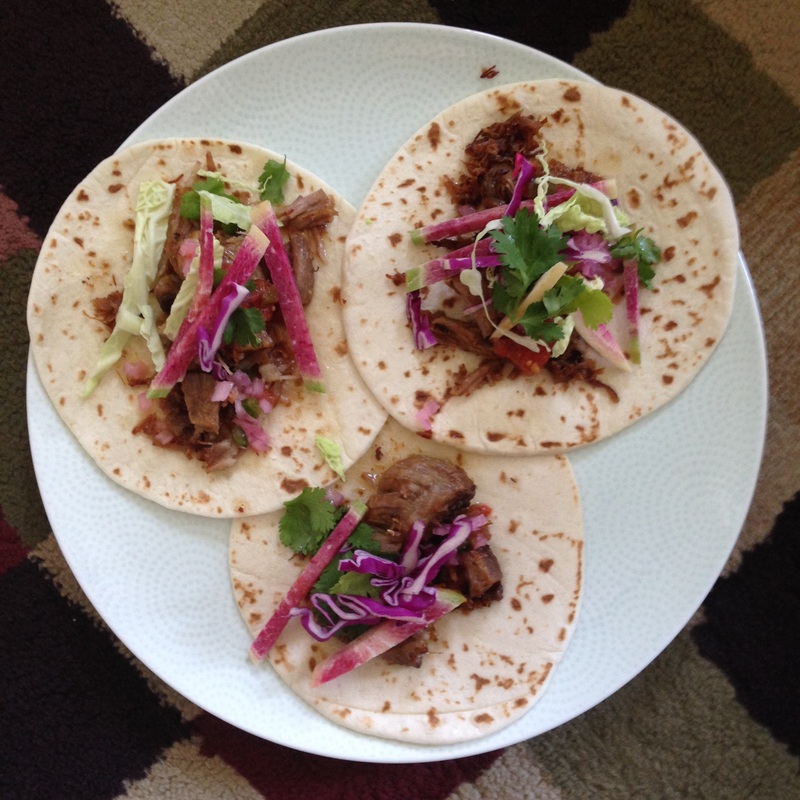 Because I have discovered the wondrous miracle of homemade pork carnitas. They’re so phenomenally easy to make and so fantastically delicious wrapped up in corn tortillas and topped with shredded cabbage and guacamole, that we might never eat anything else again. This happy disaster is all thanks to the overwhelming heat that’s already settled in over the District. I’ve been on the hunt for recipes that require as little heat in the kitchen as possible – a cobbler that’s steamed on the stove top instead of baked, a cold noodle salad folded into lettuce cups, and these carnitas, which taste as though they’ve been roasting for hours, but have really been simmering lightly, barely steaming and wonderfully fragrant. After nearly five years in DC, I’ve grown use to the oppressive summer heat arriving on Memorial Day weekend. I’ve even come to accept it; after all, it is the unofficial start of summer. But in Rangeley, where I spent all of my childhood Memorial Days, it felt more like the start of spring. Fifty degrees in the sunshine. Just a few weeks earlier, the ice would have gone out on the lake. And a day or two before we arrived for the weekend, the boat was taken out of dry dock and parked at a slip at Oquossoc Marina, the dock was installed, and the mooring was attached to its chain, waiting for its ward. We carried the canoe down to the dock, brought out the deck furniture, and unfurled the flag. We had all the trappings of summer, but the second our finger tips touched the surface of the lake, as we took turns diving in, we knew summer was still a long way off. It was a crazy tradition, swimming on Memorial Day. I blame dad for its invention, though I don’t actually remember how this polar plunge began. The water couldn’t have been much more than fifty degrees – so cold it hurt and forced your breath to catch in your chest. But oh! what a feeling when you climbed up the ladder onto the dock and the cool spring air felt gloriously warm and the birds seemed to twitter more loudly and the lapping water sounded like music and the buds on the trees were green as emeralds. Not even pork carnitas can compare to that.